If Taylor’s smallest guitars were real human babies, the Big Baby Taylor would be the one that probably got the most milk growing up. Big Baby, or BBT sports the largest of the company’s small guitar bodies. This 15/16 scale dreadnought may be smaller than full-size guitars but it can definitely jam with those big boys. If you’re looking for a beginner acoustic guitar to start your musical journey with, the Big Baby Taylor is one you should consider. It’s portable but doesn’t compromise on volume and tone. It has also received a lot of raves from guitarists of all skill levels, so it’s definitely a good buy worthy of your hard-earned money. Why, exactly? Check this big baby out and see for yourself. At 19.5 inches long and 15.1 inches wide, the Big Baby Taylor is just a few inches away from being called full-size. It’s the plus-sized sibling of the Baby Taylor and has the same arched back, which not only makes the guitar sturdy but is also a factor in producing an impressive, robust tonal output. Because it’s smaller than a full-sized acoustic, the Big Baby Taylor is definitely more portable and travel-friendly. And because it’s larger than a travel guitar like the Baby Taylor, it has a greater volume output and bass response. Taylor’s Big Baby features a solid top made of Sitka spruce, which gives the guitar a broad dynamic range and makes it versatile no matter your playing style. Whether you like to rock it out with some hard strumming or enjoy delicate fingerpicking, Sitka spruce is there to help articulate your music clearly. Sitka spruce is not only strong but elastic as well, making the BBT a great all-around acoustic guitar. The sides and back are made from layered sapele. The middle core is made of poplar and it’s sandwiched between veneer sapele layers. The use of layered sapele adds to the guitar’s strength, resilience (helpful if you travel to places where humidity levels and temperature change all the time) and durability as well as its overall look. It also makes the Big Baby more affordable, so thanks for that, Taylor! The neck of the Big Baby is made from solid sapele, while the 20-fret fingerboard is made from authentic African ebony. The fretboard has simple dot inlays that add to the simple-yet-striking appeal. The top, back and sides all have a matte finish for a clean, sophisticated look. The soundhole is adorned by a single ring rosette and complemented with a tortoiseshell pickguard. The BBT’s non-cutaway dreadnought body is 4 inches deep, which is just half an inch shallower than a regular dreadnought. It does, however, have the same 25.5-inch scale length. Size and scale length combined, the Big Baby translates to an acoustic that is smaller than a traditional dreadnought but with a richness and projection of one. The slim profile contributes to the guitar being extremely player-friendly, making it a great choice for young guitarists or those with a small frame. Taylor’s Big Baby also features die-cast chrome tuners, Nubone nut, Micarta saddle and African ebony bridge. 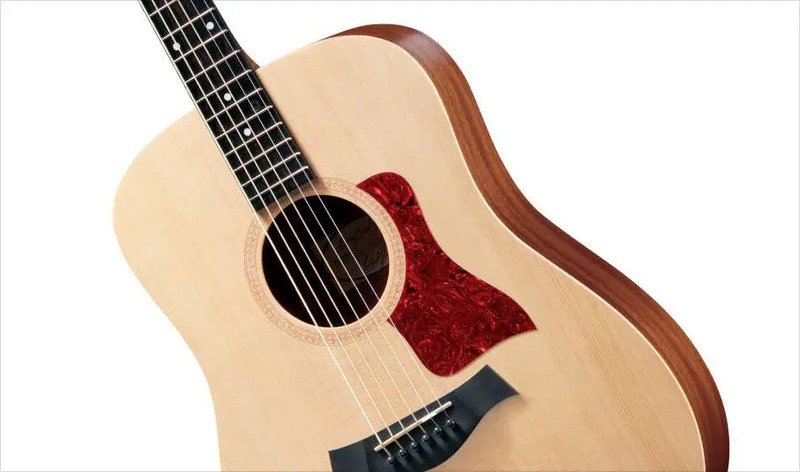 The materials and construction show quality, something that Taylor guitars are known for. The low action is great for fingers just starting to learn, making learning to play the guitar a lot more comfortable and fun. The guitar comes with a snug Taylor padded gig bag for musicians on the go, and with the BBT you will surely find it easy to go anywhere. It’s lighter and a lot easier to hold and transport than the other dreadnoughts on Taylor’s lineup, plus it’s more affordable too. The Big Baby Taylor doesn’t come with electronics, which is all fine for most players. If you do want to have a pickup installed, it’s also possible with the help of a local Taylor dealer. As we’ve mentioned earlier, the Big Baby Taylor has a greater volume output than the smaller Baby Taylor. It’s as close to a full-size body as it can get without being “too big” after all. Aside from projection, the Big Baby also offers loads of sustain and resonance for its size. The combination of Sitka spruce and sapele woods results in a rich, well-balanced sound. The X-brace on the solid Sitka spruce top delivers that signature Taylor crisp sound. It may not be as loud as a regular dreadnought, but the projection is certainly the best you can get for a guitar of travel size. The responsiveness of the guitar makes it great for different playing styles, particularly fingerpicking. And because the top is made of solid wood, the sound quality of the BBT will improve as the years go by. The Big Baby Taylor has a good, strong mid-range, so you will find it easy to hum and sing along while playing. This is a plus for beginners who are starting to develop both their note-listening and singing skills. Why buy the Big Baby Taylor acoustic guitar? Many guitarists, both aspiring and advanced, are always on the search for the best instrument that would go well with their playing style. Most of them also look for a sturdy guitar that isn’t too heavy and bulky, something that they can take along to school, the music studio, gigs, their favorite camping grounds, the beach – anywhere. There are also intermediate players who want to upgrade to a better instrument, something that they will hold on to as they continue to hone their skills. At under $500 – gig bag included – the Big Baby Taylor fits the bill. Sure, it may be a bit more expensive than other entry-level acoustics, but it’s a Taylor. If you’ve always wanted a Taylor but have only less than $500 to spend, consider the Big Baby. And with a Taylor you can be assured that your investment is worth every penny. The overall build and sound of the Big Baby Taylor makes it a must-have for those looking for a quality instrument at a reasonable price. The Big Baby is a wise buy because with it, you would seem to have two guitars in one: a near-full-size dreadnought and a portable travel guitar. The Big Baby Taylor plays like a dream and is a guitar kids will grow up with and even grownups will enjoy – a guitar you won’t regret buying.